The BBC World Service visited Raiganj in July 2008 to film the PRECISE program activities for a documentary on child health.The documentary, titled Child Health, was part of BBC’s Survival Series and aired on BBC World News on November 08, 2008. The crew filmed elements of the PRECISE program including an interview with one of the Anchal mothers from Brommogacha regarding the crèche activities and an interview with a mother regarding the home safety program. 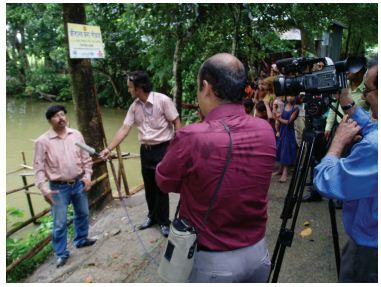 Dr. Saidur Rahman Mashreky, one of the founding members of CIPRB, was also interviewed. He provided an overview of the core components of the PRECISE program, including the water safety program.